Yesterday, I visited Sam’s Downtown Feed & Pet Supply for my second bale since I moved back to NorCal. I bought a bale of their forage hay (oat, wheat, and barley) to mix it up for the bunnies since they have only had orchard grass for the past year. The rough dimensions of this bale was 44″L x 24″W x 17″H. My last orchard grass bale from Sam’s Downtown Feed was about 44″L x 22″W x 15″H. As a result, make sure that you have a car large enough to hold this bale of hay to take home! The Toyota Sienna fit it with no problems once I took out the last row of seats, as seen in the picture above. The other times, I used my Honda Fit which also fit the hay in the trunk comfortably with the back row flattened. 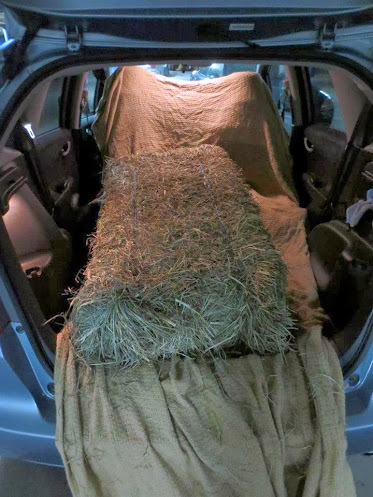 A bale of orchard grass from Mary's Tack & Feed in my Honda Fit. A friend pointed out that the forage bale I bought looked a lot like straw which is not nutritious for rabbits and should not be a main source of feed — although it is perfectly fine as a bedding and also safe to eat. Thankfully, I was much assured after a closer look at the hay and researching more on the interwebs about the differences between straw and hay. Apparently, straw is also a by-product from these grains (oat, wheat, and barley), but only after they have had all their seedheads harvested. 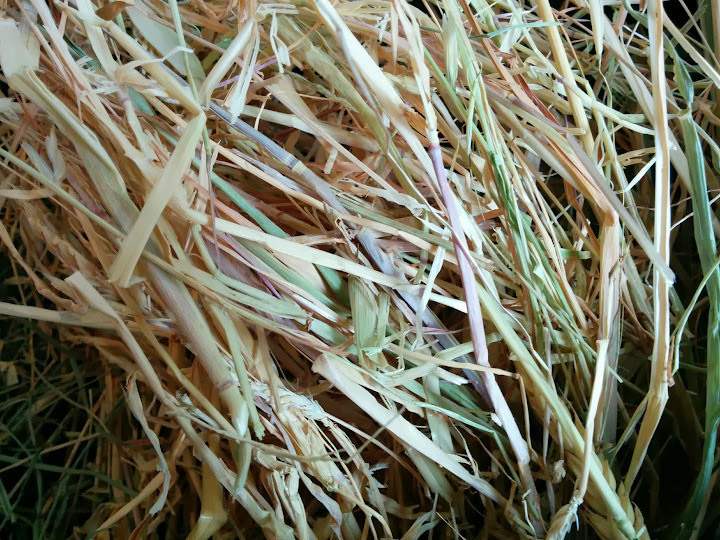 Straw bales are often half to a third of the weight of a hay bale as they consist empty husks. Looking at the bale I bought, there was much more green than expected in a bale of straw and separating them into trash bags to store still resulted in very heavy bags, so I am pretty sure this is hay, not straw. 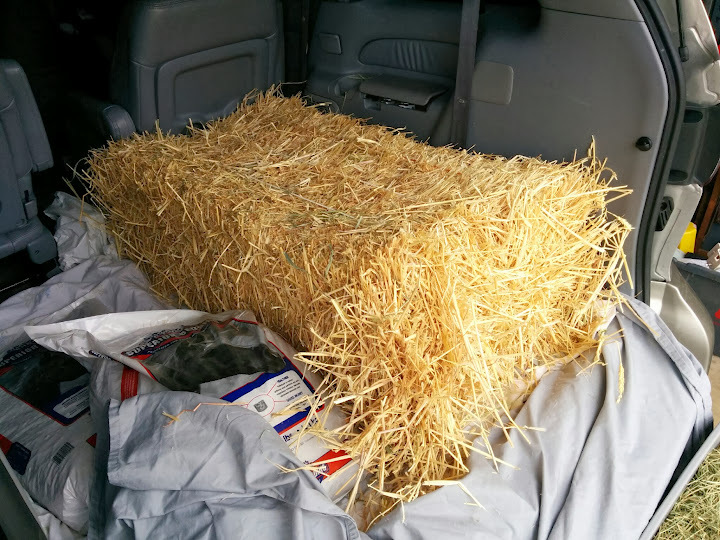 To go on to the main point of this post, as stated in the title, here are a listing of farms and stores that I found online that are a sane drive from the Bay Area that sell single bales of hay for rabbit owners. You should also double check by calling to see if they have single bales of non-alfalfa hay before you visit. Hope this helps someone else feed their rabbits for cheap! Sam’s Downtown Feed & Pet Supply – 759 W San Carlos St, San Jose, CA 95126, (408) 287-9090. Sells bales of alfalfa, orchard grass, and forage hay (oat, wheat, barley). Dave’s Hay Barn – 1055 Commercial Ct, San Jose, CA 95112, (408) 292-3337. Sells bales of orchard grass, orchard meadow mix, alfalfa. Location changed from previous address at E Julian St.
Ganado Feed – 2331 S 7th St, San Jose, CA 95112, (408) 289-8626. Sells bales of alfalfa, oat, wheat, orchard grass, and orchard grass/alfalfa 50/50. Garrod Farms – 22647 Garrod Rd, Saratoga, CA 95070, (408) 867-9527. Sells bales of orchard/meadow grass. Giordano Farms – 5285 Snell Ave, San Jose, CA 95125, (408) 761-9831. Sells bales of oat hay. Brown’s Ranch & Supplies – 20300 Almaden Rd, San Jose, CA 95120, (408) 268-4980. 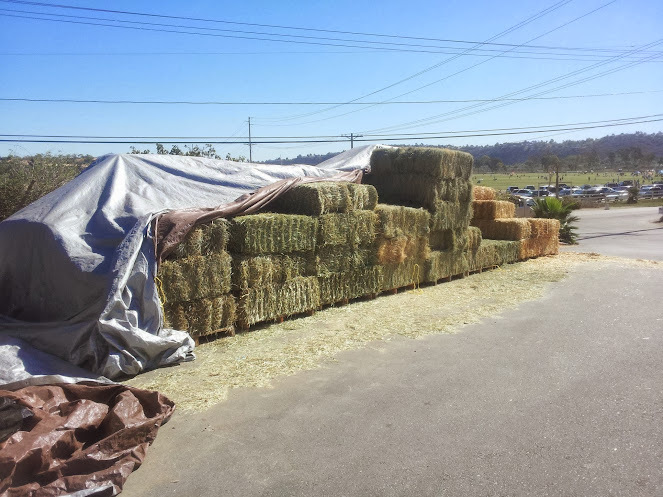 Express Hay & Tack Supply – 14905 Olive Avenue, Morgan Hill, CA, 95037, (408) 779-6621. Sells bales of grass, alfalfa/grass, and alfalfa. Silva Ranches Feed Store – 12310 Santa Teresa Blvd, San Martin, CA 95046, (408) 683-2348. Sells bales of alfalfa, wheat, forage, oat, and grass/alfalfa. G & K Farms of California – 720 Las Animas Ave, Gilroy, CA 95020, (408) 848-1400. Sells bales of alfalfa and oat hay. Silacci’s Feed Barn – 8787 Monterey St, Gilroy, CA 95020, (408) 842-4778, phone number not in service. Portola Valley Feed – 884 Portola Rd, Portola Valley, CA 94028, (650) 851-1750. Sells bales of alfalfa, orchard grass/alfalfa, orchard grass, and timothy. Azevedo Feed – 1815 Miramontes Point Rd, Half Moon Bay, CA 94019, (650) 726-6160. Sells bales of teff, meadow, timothy, valley, and orchard grass hay. Pastorino Hay – 921 Miramontes St, Half Moon Bay, CA 94019, (650) 726-6155. Sells bales of alfalfa, grass/alfalfa, oat, orchard grass, red oat, timothy, and timothy/grass hay. Mike’s Feed & Pets – 710 E 14th St, San Leandro, CA 94577, (510) 638-2005. Will order a bale of hay if you call ahead. Concord Feed – Will order a bale of hay if you call ahead. Bay Area Hay and Feed – 101 N Greenville Rd, Livermore, CA 94551, (925) 998-0911. Sells bales of alfalfa, wheat, timothy/orchard mix, and forage (oat, barley, wheat) hay. Please comment if you have found other good sources of hay bales in the Bay Area or more details about any of these companies so that I can expand my list! For more information about hay types, see the WabbitWiki article on hay. For information about how to break up and store bales of hay, see the WabbitWiki article on hay bales. Update Feb 17, 2016: Added Garrod Farms to the list. Hi, Thanks so much for your advice on where to get hay in the south bay. How do you store the large bales of hay? I currently have a couple of extra-large totes that I use to store the hay outside. I’ve also put them in large cardboard boxes and giant black trash bags when I’ve had the space indoors. I’m considering buying a bale bag like this one on Amazon so that I can store it more compactly. The bale expands a lot once you cut it open and try to separate it. Westside Farm and Feed (http://www.westsidefarmandfeed.com/) in Santa Cruz carries timothy hay bales. We have been buying bales from then for several years and have consistently been impressed by the quality of the hay. Thank you so much for this list! I’ve been getting Oxbow at AnJan’s for forever, but right now their hay is brown with few heads and the bunnies don’t like it. I live in San Mateo so picking up hay in HMB is an awesome way to get 2x timothy hay for 1/2 the price. Thanks again!